Liverpool goalkeeper Brad Jones couldn’t stop the game-winner late in the second half. The bagpipe band played adjacent to a swarm of Italian fans, while just feet away others scarfed down hot dogs. There was a replica to Liverpool’s famed Shankly Gates — named in honor of legendary manager Bill Shankly and embroidered with the club’s slogan, “You’ll Never Walk Alone” — under which giddy Reds supporters posed for pictures. During one of the shoots, a young lad sporting an Azzurri jersey said the picture could be made better with some Italian influence. Meanwhile, a man on giant stilts was plodding through the street, and a woman was juggling three different-colored soccer balls. Fans strolled around in jerseys and shirts representing clubs and national teams from England, Italy, the United States, Brazil, Argentina, and Cameroon. Of course, many were guzzling the fundamental bonding substance, beer. Such was the environment of cultural fusion — English, Italian, and American, especially — outside of Fenway before AS Roma’s 1-0 win over Liverpool Wednesday night in front of a sold-out crowd. Inside the historic stadium, it was little different. The game showed that the US, one of the few countries that doesn’t yet treat the sport as religion, is embracing the soccer synthesis, Liverpool manager Brendan Rodgers said. 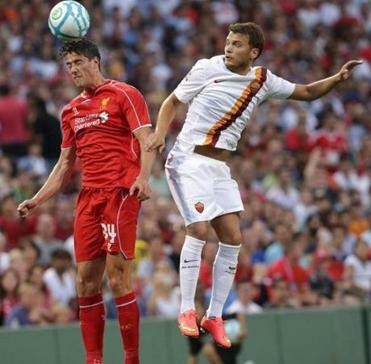 On the baseball-diamond-turned-soccer-field, English club Liverpool and Italian club Roma danced and deked their way to a result that was short on chances and long on experimentation. Second-half substitute Marco Borriello scored the game-winner in the 90th minute off a volley from a corner kick. 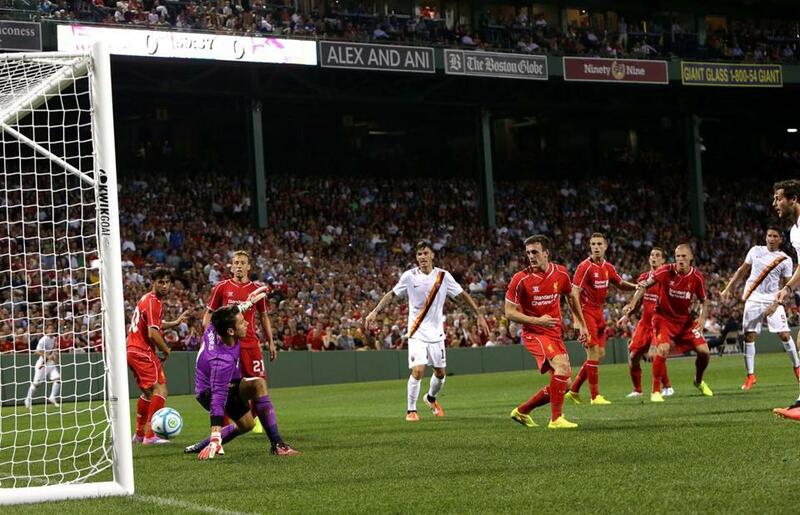 The shot was deflected by a Liverpool defender before sneaking past Reds goalkeeper Brad Jones. Until then, though, chances were trifling. The game was a preseason friendly in every sense of both words — neither Steven Gerrard, Liverpool’s ageless captain, nor Daniele De Rossi, Roma’s midfield magician, was in their respective clubs’ lineups, and both teams used several substitutes — but again provided world-class soccer in an unusual setting. “These are two Champions League teams,” Rodgers said. “Two teams that are at a good level of preseason, and two sets of committed players that are very competitive. Both teams wanted to play well. I thought it was a perfect game at this stage of our preparation. Neither team had a shot on goal in the first half. Roma had more opportunities offensively and nearly scored in the 32d minute. Roma left back Ashley Cole, who was booed nearly every time he touched the ball in the first 45 minutes (he transferred to the Giallorossi earlier this summer from Liverpool Premier League rival Chelsea), made a probing run down the left flank and crossed the ball in front of the Reds’ 6-yard box. Francesco Totti, Roma’s all-time leading scorer, connected with Cole’s ball but hit the shot wide. In the second half, summer signing Rickie Lambert almost scored twice in the span of two minutes. His second chance, parried away by Roma keeper Lukasz Skorupski in the 55th minute, was set up by shifty midfielder Philippe Coutinho. That crowd, composed of mostly Liverpool supporters, was a sea of red, little different than a Red Sox home game. It was fitting, then, that while two of the world’s top soccer clubs played a preseason friendly, the score of the Sox game in Toronto was displayed and updated on the Green Monster.